DUMBO is an acronym short for Down Under the Manhattan Bridge Overpass. The neighborhood is in the New York City borough of Brooklyn and was originally a ferry landing. DUMBO was once a neglected industrial stretch of Brooklyn, but in the 1990s artists started to move there and soon a small creative scene began to transform the neighborhood. Now the area is comparable to SOHO with shops, galleries, and restaurants. Travelers can take a stroll through DUMBO's interesting little streets to get the flavor of this historic, and now trendy, waterfront Brooklyn neighborhood. It's the first neighborhood in Brooklyn after crossing the Brooklyn Bridge, and many Brooklyn residents just pass right by it, en route to the city. However, when travelers have just crossed the iconic Brooklyn Bridge and are looking for a fun afternoon, they can spend the day exploring Front Street in DUMBO. 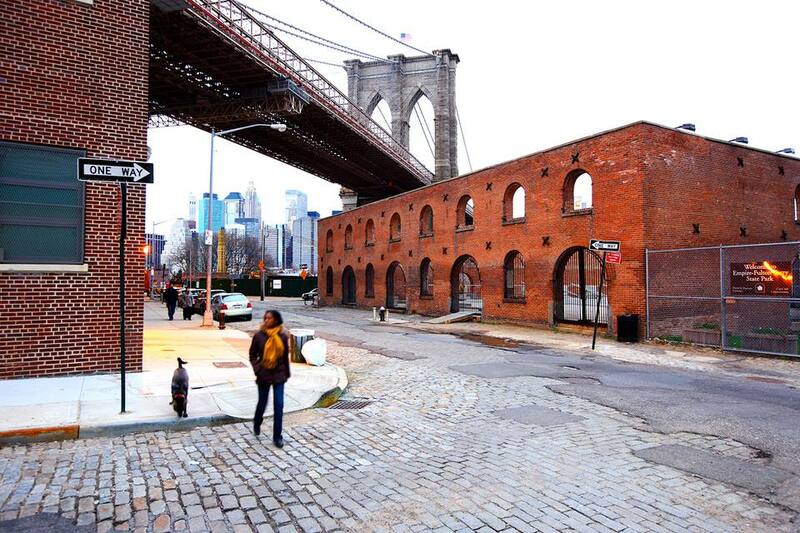 Below are 10 things to do in DUMBO on Front Street alone. DUMBO is known for its amazing restaurants. In fact, at the beginning of Front Street, travelers will see a perpetual line in front of the famous Grimaldi's Pizza. If you don't want to wait an hour for a pie (it's worth it! ), there are numerous places to dine on Front Street, from the uber-hip yet extremely laid back Superfine, to the festive yet classy Mexican restaurant, Gran Electrica. Travelers who want some casual and incredibly tasty food can check out Old Fulton Street, right next to Front Street. This is where an outpost of New York City's favorite burger and shake restaurant is located, known as ​Shake Shack. Travelers who aren't sure about what they're in the mood for should just stroll down Front Street and check out all the various options. There are many places to shop in DUMBO. In the summer months, the Brooklyn Flea sets up shop underneath the historic Brooklyn Bridge, which is just steps from Front Street. Travelers don't need to wait until the spring to shop in DUMBO. Front Street is home to a large outpost of Brooklyn Industries and other shops. If you're on the hunt for home decor, peruse Journey on Front Street. The shop has furniture, lighting, art and other items to enhance the home. Fans of vintage goods must stop in the well-curated Front Street General Store with its selection of electric vintage goods and other items. When you walk to the beginning of Front Street and stand in front of Grimaldi's Pizza, you will see the Fulton Ferry Landing. Hop on the East River Ferry to Manhattan or Williamsburg at the ferry landing or soak in the stunning views of Lower Manhattan. This is a popular spot where people take wedding photos and other special event photos. Travelers will also notice a parked barge, a flat-bottomed boat, at Fulton Ferry landing. This is ​Bargemusic, a unique music venue that hosts many classical concerts and is a must-visit for any music lover coming to Brooklyn. The "floating concert hall" also offers free Music in Motion concerts for families on Saturdays at 4 pm. After perusing the many shops on Fulton Street, make a left and head to the water for the entrance to Brooklyn Bridge Park where you can enjoy a ride on Jane's Carousel. Just a couple of blocks from Front Street on Water Street is the new home for St. Ann's Warehouse, one of New York City's most respected cultural venues. This is a great place to see a show that isn't on Broadway. Walk down Front Street and make a left on Adams Street to stop in Foragers. This is a great place to grab some sandwiches and food for a picnic before heading over to the Brooklyn Bridge Park for a nice meal in the outdoors. Just blocks from Front Street is the entrance to the Brooklyn Bridge. Take a walk across the bridge and check out the views. The bridge is over 1.1 miles long. There are galleries on Front Street, as well as other parts of DUMBO. Stop by Smack Mellon, a staple in the DUMBO art world. The gallery houses work of emerging and under-recognized artists. In addition, Smack Mellon's Artist Studio Program offers artists studio space. Before walking down Front Street, be sure to visit the Brooklyn Ice Cream Factory on Fulton Ferry Landing housed in a former fireboat house.